I'm really excited about the Great Monday Give this week as it is my all time favorite by one of my all time favorites. 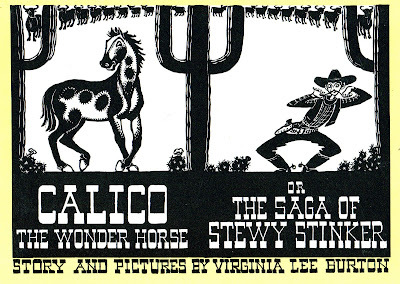 Calico the Wonder Horse or The Saga of Stewy Stinker by Virginia Lee Burton is so innovative and inventive, that on first read, you almost can't believe how great it is. What I am offering up is a very tight and nice mylar covered ex-library hardcover. Near perfect really and a great addition to any library. To win, all you have to do is comment on this post between now and midnight ~ Sunday ~ October 26. At which point, a winner will be selected using the highly technical, blind/scroll/and point method. My fifty-something year old aunt has always been obsessed with Eloise and I've had some apprehensions about sharing the books with my four year old since Eloise is a bit... haughty. I think it could be fun, though. Rawther. I understand the apprehension, but my son thinks the haughtiness is rawther hilarious so I believe your girl will be OK. If however, the next time you stay in a hotel, she picks up the phone and dials room service -- charge it please and thank you very much -- DON'T BLAME ME! Congrats and please e-mail me your shipping info to webe(at)soon(dot)com. Virgina Lee Burton is one of our favorite authors. I can't tell you how many times I have read The Little House, Mike Mulligan or Katy and the Big Snow. Our library doesn't have Calico the Wonder Horse. But a good cowboy story would always be welcome around these parts! I remember when you first reviewed this one, and it sounds fabulous! Oh, how we love Virginia Lee Burton! We would love to add this one to our little collection! Wow, those illustrations are amazing! I am wondering when Jasper will start a cowboy collection. Haven't heard of this one. Looks nice though! Oooh. I love fun books. This book looks great; we can always use a new cowboy book! We're leaving our home in Oklahoma to move to Indiana on the 19th. Don't we NEED this book???? We love Virgina Lee Burton in our house! We don't have many cowboy stories at home and we should since we live in Texas! LOVE LOVE LOVE Virginia Lee Burton!! What a fantastic book! I love seeing books that I have forgotten about! We are all about cowboys at our house! If I don't win I'm going to have to track this one down because I would hate to never read one of your favorites. It must be just the amazing. P.S. I missed the talk about Eloise- but I wouldn't want to read it to my kids because I really have a hard time reading through it. I wish I was a better reader. Practice makes perfect!? We're always looking for great horse books. Thanks for the lead! i would love love love this book for sweet pea. either way it's a must have for our collection! thanks for sharing! ooh, this one is sweet! And what a neat black and white look to it. perfect for a papercutter to examine. Hope you pick me so I can see why it is your favorite!!! Looks terrific. Count me in! I have never left a comment on a blog or entered a giveaway before, but my boys would "go to the end of the trail" for Calico, Hank and Stewy Stinker, the man who would "rob Santa Claus on Christmas Eve". Despite stiff competition from The Little House, Mike Mulligan and Life Story, this is our all-time favorite Virginia Lee Burton book. We've been poking through bins at yard and library sales in search of a good hardback copy, but haven't found one yet. It's like gold. Just found your blog through Angry Chicken.....this sounds like a wonderful book. Great giveaway. I haven't heard of that book, but I do love Eloise! I don't think I ever tried to imitate her as a kid, although I'm sure I would have loved to! I just had to return our copy to the library because we renewed it the maximum number of times. We checked out another copy when we returned the other today! I was singing the praises of this book just this morning...this is my 5 yo son's current favorite book! WE love this book and would love to own it!!! Thanks for doing this! Please include us! My brother introduced me to this wonderful site. This looks like a great book to add to our collection! I just found your site and am having so much fun catching up on all the books I read and loved as a child. I can't wait to start reading some of these books to my children. I'm in. Reading picture books is a passion at our house. Even my 14 yob reads them! And I have to echo ittybittybirdy, who said "If I don't win this one, I'll have to track it down." Ah, the thrill of the hunt! The black and white cover looks great. And anything with "Stinker" in the title is sure to be a hit. Looks like a great book. I love Virginia Lee Burton. I just found your site today and I am very excited. I have a lot of ground to make up...We have been building our collection of vintage books for the kids from garage sales and sally-ann or V.V. This is the greatest find for me since I found bookmooch! Wish me luck in the "give"
I love Virgina Lee Burton. The Little House is known by my kids as the book that makes mama cry b/c it reminds me so much for my childhood home. We love Stewey Stinker also! The crisp black and white images are fantastic! I loved this one when I found it at the library the other day. I find myself wishing Virginia Lee Burton would have written more books. Loved them all. We have not read this but I know my 5 year old boy will love anything with with the word "Stinker" in it!!! The cover is great! I'd love to see that just for the title alone! I love Virginia Lee Burton books, especially The Little House, but I have NEVER seen this one. I hope I win it!!! Ohhhh....I'm sorry I missed the deadline to win this but I'm sure glad I found your amazing blog! We love vintage books too and I just finished reviewing a vintage cowboy book...so ironic. I hope it's okay that I linked your blog to www.beeskneesbooks.blogspot.com.